RFID stands for radio frequency identification and describes the short-distance exchange of information between an RFID reader and chip, like holding up a key fob to get into a building. While concerns have recently been raised, this is not a new technology. RFID chips have actually been used commercially since the 1980s. For decades, chips have been used in security and ID badges, for tracking packages, in shipping and warehousing, in library books, and in retail stores to prevent shoplifting. Most items that you’d be carrying around have a passive RFID tag, which means that it doesn’t broadcast your information unless an RFID reader sends out a signal. These operate on a small distance and can’t transmit very much information. An active RFID tag has a battery and broadcasts a signal all the time; a good example is a toll pass mounted on a car. Most RFID chips that you’ll be dealing with will either operate at a low frequency (125–134 kHz) or high frequency (13.56 MHz), and you’ll see some products that advertise protection for some frequency ranges over others. Do I have any RFID cards? That depends on where you live and what kinds of credit cards and IDs you carry. Some states (Washington, Vermont, Michigan, New York, and Minnesota) include RFID tags in driver’s licenses, and several other states are making the transition. All passports issued since 2006 have them, as do passport cards, to make customs processes easier. If you have an electronic key or ID badge that you scan (not swipe) to get into a building, that has an RFID chip as well. 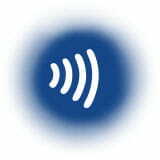 RFID credit cards allow you to use near-field communication (NFC) terminals where you simply hold up you card within a few inches of the machine and it will read your information to process a payment. You see this in contactless credit cards such as Visa payWave, MasterCard PayPass, American Express ExpressPay, and Discover Zip. Some of the new EMV chip cards have RFID tags as well. Unless you can use an NFC terminal, you probably don’t have an RFID chip in your credit card. If you’re not sure, look for an RFID symbol on the card. Should I be worried about skimming? Although an entire industry has grown around the fear of having your RFID chip information skimmed, there are some protective measures already in place to prevent that from happening. While some of the new EMV chip cards do have NFC capability, keep in mind that those cards have encrypted transaction codes that are only good for one payment. So even if someone did steal your card information, they’d only be able to use the card once, and you wouldn’t be liable for the fraudulent charges. The information stored on the chips in passport cards and some driver’s licenses is only meaningful if you also have access to a government computer that can match the number on the RFID tag to your information in the database. Passports have protective metallic material in the covers so the chip can’t be read unless the passport is open, and even then, the chip is programmed to deny access to any device without the proper authorization. In short, it is very unlikely that your information will be stolen through this method at this point in the United States. Several initial studies and demonstrations of the risks of RFID hacking and skimming are from ten years ago when the RFID cards were a new technology and there were security gaps that no one had thought to fill yet. While it is possible for a hacker to skim your information, it is a lot of work for relatively little gain. In other words, it’s not likely that your information will be skimmed this way when there are more profitable ways to do so. How can I be sure my information if protected? If you are still concerned about the security of your personal information, there is a wide variety of ways to give your cards and information an extra layer of protection. First of all, if you’re uncomfortable with having an RFID credit card, you can ask your credit card company if the RFID chip in your card can be disabled or if you can receive a card without an RFID chip. Just keep in mind that you won’t be able to use the card at NFC terminals. Metal will block an RFID signal, so the most basic protection you can create is a layer of aluminum foil around your cards or wallets. You can even find instructions online for making your own wallet out of duct tape with a foil layer inside. Some people also recommend using an Altoid tin and report good results when it comes to blocking incoming signals. This isn’t an elegant or foolproof solution, but it is certainly your least expensive option. 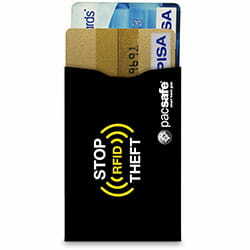 Wallets: Just as with non-RFID blocking wallets, these come in many styles, materials, colors, and shapes. Most wallets with RFID protection have a layer of metal mesh or similar material within the outer material of the wallet, whether it’s a bi-fold, clutch, or zippered pouch. This means that the barrier is there if the wallet is closed, but won’t be when the wallet is open. Card cases: These are often made of metal or another durable material and vary in terms of how many cards they can hold. Some are designed to protect only an ID and others may hold several cards at a time. These may be less easily carried in a pocket because they tend to be less flexible. Card sleeves: Generally designed to slip over a single card or ID, these can be found at very low prices and can be purchased in packs. Using card sleeves means you can keep your regular wallet and just protect the cards with sensitive information. The problem is that the sleeves will add to the bulk of the wallet, especially if you have several of them. Passport covers: As the name indicates, these fit around your passport to give your personal information an extra layer of protection. Some are basically a sleeve for your passport, while others have space for ID and credit cards. Travel bags: Some travel bags include RFID protection either in the lining of the entire bag or in just one or two pockets meant to hold your passport and credit cards. In every case, look for products that are electromagnetically opaque or are FIPS 201 compliant with GSA (General Services Administration) approval. That means they’ve been approved for governmental use and have the best rating that currently exists. There are several companies whose products have received this rating and are recommended below. Although there is an entire industry of RFID-blocking wallets, sleeves, cases, and holders, the chances of having your RFID cards skimmed from a distance seems pretty remote at this point. 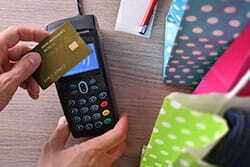 Thieves can find other, more effective ways to steal card information, especially since a lot of your personal information is encrypted or inaccessible without a government computer. However unlikely, it is possible for information to be stolen by skimming, and if you need that extra measure of security to feel safe, there are several products available. Wallets and card protectors that claim to prevent RFID skimming are not always 100% effective, so look for items that are FIPS 201 compliant with government approval. You always have the option of making your own shield with aluminum foil, and as always, be smart about what cards you carry and how you use and access them, especially if you’re traveling internationally or in a country where contactless cards are more common than in the United States. Let us know how you approach RFID card protection. Comment below to tell us how you keep your cards safe.